Mike Fietchner/Sounders FC CommunicationsHandwalla Bwana in action for the Seattle Sounders on MLS opening day. His upbringing in the camp was fraught with challenges, but didn’t stop him from honing his socccer skills everyday. 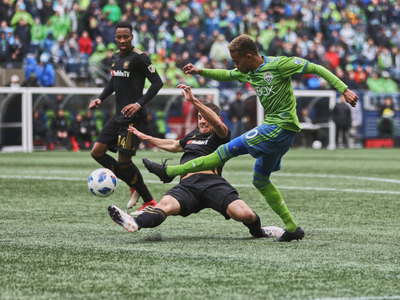 Handwalla Bwana, an 18-year-old who recently signed a contract with the Seattle Sounders in Major League Soccer, still remembers playing soccer “on sand or dirt” out in the sweltering heat in a refugee camp, as noted in a piece published by SB Nation. Despite this, he was still able to work on his soccer game. Bwana recalls his mother telling him, “You would run around the house with a little ball, and you would kick it, and you would not stop, like literally no stop.” He also frequently had to kick around garbage in lieu of an actual soccer ball. But Bwana and his family adapted, and he thrived on the soccer pitch, enough to earn a Homegrown Player contract from the Seattle Sounders. He made his professional soccer debut this past weekend, logging 26 minutes in the Sounders’ season-opening match. “It is extremely important to see people from Kakuma succeed outside the camp,” Tom Mboya, an NGO worker, told SB Nation.